For decades, LCHSA has kept Meeting Minutes, which are in the process of being digitally scanned and preserved. Read about the history of the Horse Show and a sampling of minutes from 1947. In 1944 a group of people living around Ludwig’s Corner banded together to give a horse show at Ludwig’s Corner. The group consisted of Mrs. E.C. Shaw, Mr. and Mrs. Stanley Dare, Mr. and Mrs. Jesse Baxter, Mr. & Mrs. Charles Hamilton, Mr. and Mrs. A. L. Coffman, Mr. Richard Coffman, Mr. Guy Richards, Mrs. Henry Biddle, Jr., Mr. and Mrs. Edwin Bruner, Mr. Scott Rice, Mr. A. Chapin Rogers and Mr. Joseph Myers. They were all very fond of horse and enjoyed fox hunting in the territory of the Eagle and Kimberton Hunts. Around the opening of fox hunting season on Labor Day, it seemed to them, would be a good opportunity to get together to put their hunters through their paces. It would also be a means of bringing the whole community together for a day of fun and visiting. The proceeds of the days entertainment would go to the local Boy and Girl Scout Troops to help maintain their activities. Accordingly, the whole committee banded together to erect a ring, jumps and Judges stand on the farm of Edwin Bruner. Everyone gave of their time, their lumber or their financial means to put the grounds in shape. Friends were solicited who made substantial contributions. The day was a great success; many entries came, the crowd was enthusiastic and when all the bills were paid, it was found that $668.00 was on hand to be given to the Scouts who had assisted in every way they were able. With that kind of interest, the committee decided to become an organization which would annually give a show. Accordingly, they began making improvements for a permanent show grounds. 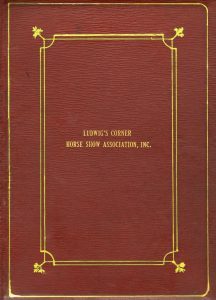 1945 found the Ludwig’s Corner Horse Show giving its second show. Again it benefitted the local Girl and Boy Scouts who received $270.41. The beneficiaries named for the 1946 Labor Day Show were The Crippled Children’s Clinic of Phoenixville Hospital and The Chester Valley Community Nurse Association.